Kablooie is a carefully produced, handmade fashion label, Australian owned and made. I'm all about showcasing local Australian fabric designers and makers in big, bold crazily fun fabric and fun collaborations, usually involving awesome accessories. Wanna work with Kablooie? I love collaborating with businesses that align with my brand, and I’m always thrilled to be featured in your blog or publication! Grab a copy of my media kit here. Sometimes when I'm not designing fun new stuff for you, or sewing your orders, I write guest blogs for pretty cool peeps. Or I get featured on blogs, podcasts and other websites, which is also pretty cool. Check them out below. When I was asked for an interview about Kablooie by Sian Yewdall, the founder of Woman Rising Magazine, I was so excited! Sian's desire to inspire, support and celebrate women in business at all ends of the scale was the catalyst for launching The Woman Rising Network, a growing online hub that strives to encourage and empower business chicks in regional Australia with a bespoke digital magazine and exclusive interviews with special guest speakers via the Members’ Hub. You can read my interview with Sian here. 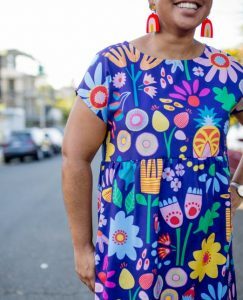 I was thrilled to be featured twice by Britt's List with a handful of other completely fabulous brands - first in an article titled '5 brands for bold summer prints'. I know you're itching to, so you can check it out here . I was super excited to be featured in a second article about fabulous Queensland based businesses - 10 Quirky Queensland labels to check out now - and if you wanna check them out now, here's the link! I recently completed the Business School For Mums Small Business Accelerator course, and its an incredibly worthwhile investment! 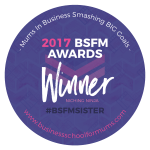 I was honoured and bowled over to receive a 2017 award from BSFM for Mums in Business smashing big goals - for being a Niching Ninja! Tracy Harris is the incredible owner of Mums With Hustle - she's all about helping bizmums find their tribe, get noticed and build a powerful brand online. I'm pretty stoked to have written a handful of guest blogs for Mums With Hustle. Learning to let go - why there's no such thing as balance for the modern Mum - have a read. My Top Shortcuts Hacks and Timesaving Tips for busy working Mums - have a read. Procrastination - How to EMBRACE discomfort and make real progress in your biz journey - have a read. Think BIG - crush your overwhelm with planning - have a read. Everything You Need to know about Instagram markets - have a read. PLUS I'm so excited to have been a guest on Tracy's weekly MWH podcast - seriously awesome fun! Have a listen! My Food Blog is the official Blog for myfoodbook.com.au, a hub for passionate home chefs. It recently published a fun piece called Food meets Fashion: wear your food and eat it too, and included Kablooie - yay! Have a read.